Moddex summarises the barrier requirements under NCC 2016 BCA Section D2.16, according to which a continuous barrier must be provided in various parts of a building. Any delineated path of access to a building. A barrier should be installed if the trafficable surface is 1m or more above the surface beneath, in the areas listed above. 1 Please note the heights are measured vertically from the surface beneath, except for stairways where the height must be measured vertically from the nosing line of the stair. A transition zone can also be incorporated where the barrier changes height from 865mm on a stair flight or ramp to 1m at a landing or floor. 2 The maximum 125mm barrier opening for a stairway is measured above the nosing line of the stair treads. Please note that the above list and table is only a small part of the compliances detailed under NCC 2016 BCA Section D2.16 for barriers. The standard must be read in full to understand all of the compliances required to create a compliant barrier system. The section views below show the Moddex Assistrail AR45 and the Moddex Conectabal CB30 systems respectively detailed to the compliance requirements in NCC 2016 BCA Section D2.16. 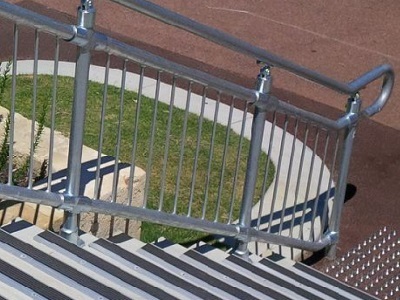 To save time and resources, and ensure ease of installation when specifying Moddex guardrails or balustrades, please consult with Moddex’s Compliance Tips or contact us on 1800 663 339 or [email protected].